The impeccable Jacky Khawly swept the two Dominican Touring Series (DTS) races at the Yokohama Grand Prix last Sunday in Santo Domingo. It was a full house event at the Sunix Autodrome. These most recent wins, add 40 points thus continuing to climb in his overall position. 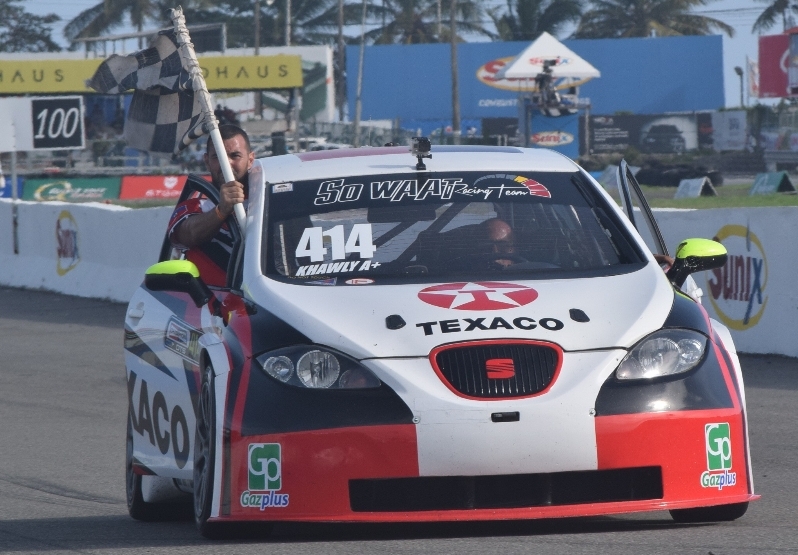 Khawly, originally from Haiti, performed the winning feat in his Seat Leon # 414 (pictured below in bold GB ENERGY – TEXACO colors) being the first this season to stand as a reigning champion in both races in the maximum category. On the first of the day of racing, Khawly started-out from the second position and on lap 6, of the 16 scheduled, managed to overtake Alfredo Najri, who finished second in front of Kiko Cabrera. The three riders raffled-off the main points of the second heat on the track, having Khawly back on the top with his second win, while Cabrera of Auto Haus Racing came in second and Najri, finished third. Najri continues ahead of the championship with 99 points, Maximo Sarraf (proudly sponsored by GB ENERGY – TEXACO’s Carrera 1 Racing fuel) remains in contention in second with 86, Kiko Cabrera places third with 85 points and our GB ENERGY – TEXACO champ comes in at fourth place with 69 points. For GB Energy-Texaco it is an honor to be represented in this renowned competition by Jhaky Khawly! Go Team Khawly!